The Nigerian Rebirth Conference was born out of the Nigeria Rebirth, an initiative of passionate and patriotic Nigerians from all works of life (ethnics, cultures and religion) with a collective and dedicated aim to structure the deep yearnings of Nigerians into an ideological framework that will drive Nigerian homes, offices and institutions; thereby becoming the bedrock of our economy and consequently reshape and redefine Nigerian image within the community of Nations. and dedicated Nigerians has metamorphosed into ‘’ The Nigeria Rebirth Project,’’ with the mission and aim to rebuild Nigeria through intelligent innovative and sustainable projects. 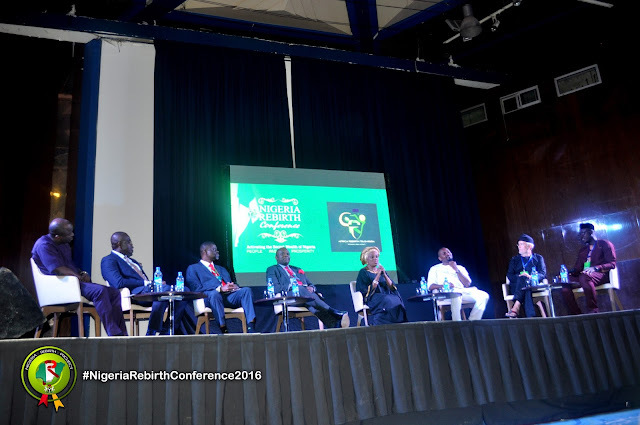 The conference themed, "Activating the Secret Wealth of Nigeria" was graced by top Nigerian dignitaries such as the Ooni of Ife, Oba Adeyeye Enitan Ogunwusi and his wife, Deputy Senate leader- Sen. Bala Ibn Na'allah, former Governor of Rotary International - Dr Mike Omotosho, Eugenia Abu of NTA and a host of other dignitaries. The Nigeria Rebirth Project was inaugurated at an event held 17th March 2016 (read here) at the Banquet hall of The Presidential Villa, unveiled by the Wife of the President, Her Excellency Aisha Muhammadu Buhari; Grand Patron of the Nigeria Rebirth Project, Vice President’s wife, eighteen governor wives, sixty three (63) ambassadors, the minister of Finance, but to name a few, in which you were ably represented by your team being part of the occasion. Nigeria Rebirth Project is determined and focused to birth a New Super Nation of every patriotic citizen’s dream. It is with this ringing endorsement that the Management of the “Nigeria Rebirth Project” (NRP) through its Events/Programmes and Concept Development Committee has designed the first ever National Development Reality TV Show, “THE LABOUR ROOM” was unveiled at the conference. The Labour Room Reality TV Show is a project under the Nigeria Rebirth Project. In order to achieve greater heights, the Nigeria Rebirth project has put together a Nigerian youth oriented and National development programme tagged the LABOUR ROOM Reality TV Show - aimed at re-positioning the mind-set of Nigerians both within the country and diaspora. We are interested in developing our local content and creating jobs directly and indirectly, through a conscious effort, by bringing together young Nigerians (home and diaspora), who will be watched for sixty (60) days with the full attention of the world on them.